The Powhatan, also spelled Powatan and known as Virginia Algonguians, are a Native American people who now predominantly reside in Virginia. The Powhatan Renape Nation is recognized by the state of New Jersey. 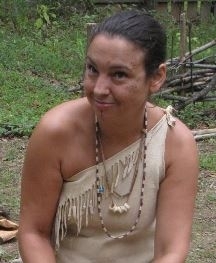 They are known for being the Native Americans in eastern Virginia when the English settled Jamestown in 1607. The Powhatan Renape Nation are descendants of Powhatan peoples who migrated to present-day southern New Jersey, where they have been concentrated in the areas of Morrisville and Medford. As of 2014, the state of Virginia has recognized eight Powhatan Indian-descended tribes in Virginia. Two of these tribes, the Mattaponi and Pamunkey, still retain their reservations from the 17th century and are located in King William County, Virginia. No known Powhatan speakers exist as the language now is dormant. As a result, all speak English. Pray evangelical Powhatan will intentionally cross-cultures and engage unreached peoples in the Unites States. Pray God will work in the lives and hearts of unreached Powhatan to experience a personal relationship with Jesus Christ. Pray Christians will intentionally plant churches among Powhatan people.